Get your kids excited to eat their veggies or add some extra flair to your next solo dining experience with Eggplant Stackers. 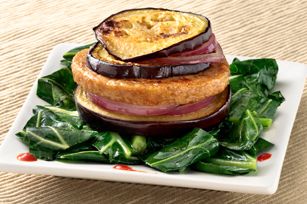 Ready in just 20 minutes, Eggplant stackers add a level of refinement to any menu with hardly any fuss. Plus, the Sriracha hot sauce adds an extra burst of flavor! Heat oil in large skillet on medium heat. Add eggplant, onions and greens; cook 10 min., stirring greens and turning vegetables after 5 min. Meanwhile, cook burger as directed on package. Place greens on plate. Stack vegetable slices and burger on greens, placing burger in center of stack. Serve with sauce. Different olive oils have different smoking points. Not sure which one to use? Click here for a helpful chart from Pompeian® that shows you how to choose the right olive oil for your recipe. Substitute fresh spinach for the collard greens. Substitute your favorite hot pepper sauce for the Sriracha sauce.